The study of economics makes individuals cognizant of their environment and better decision makers. Explain how the study of economics provides knowledge to understand the system and policies that guide life. Economics is a social science. This means that economics has two important attributes. Economics studies human activities and constructions in environments with scarce resources, and uses the scientific method and empirical evidence to build its base of knowledge. The evaluation of human interactions as it relates to preferences, decision making, and constraints is a significant foundation of economic theory. The complexity of the dynamics of human motivation and systems has led to the establishment of assumptions that form the basis of the theory of consumer and firm behavior, both of which are used to model circular flow interactions within the economy. Economics provides distilled frameworks to analyze complex societal interactions, as in the case of consumer and firm behavior. An understanding of how wages and consumption flow between consumers and producers provides agents with an ability to understand the symbiosis of the relationship rather than fixating on the contentious components that surface from time to time. Economics also allows individual agents to balance expectations. An understanding of the ebb and flow of the economy through the boom and bust of the business cycles, creates the potential for emotional balance by reminding agents to limit desperation in downturns and exuberance in expansions. By developing an understanding of the foundations of economics, individuals can become better decision makers with respect to their own lives and maintain a balance with respect to an externality that has the potential to supplement or deter their plans. Since economic theories are a basis of decision making and regulatory policy, being knowledgable about economics foundations allows an individual to be an active and aware participant rather than a passive economic agent. Economics is a social science that has diverse applications. Economics is a social science that assesses the relationship between the consumption and production of goods and services in an environment of finite resources. A focus of the subject is how economic agents behave or interact both individually (microeconomics) and in aggregate (macroeconomics). Microeconomics examines the behavior individual consumers and firms within the market, including assessment of the role of preferences and constraints. Macroeconomics analyzes the entire economy and the issues affecting it. Primary focus areas are unemployment, inflation, economic growth, and monetary and fiscal policy. The discipline of economics evolved in the mid-19th century through the combination of political economy, social science and philosophy and gained entrenchment with the increased scrutiny of the asymmetric financial and welfare distribution attributed to sovereign rule. Early writings are attributable to Jeremy Bentham, David Ricardo, John Stuart Mill and his son John Mill and are focused on human welfare and benefits rather than capitalism and free markets. 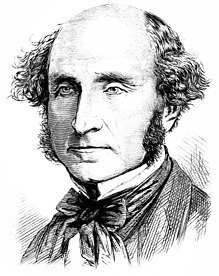 Founders of Economics: John Stuart Mill, along with David Ricardo, Jeremy Bentham and other political and social philosophers of the mid-nineteenth century are credited with the founding of the social-political theory that has evolved to be the discipline of economics. As in other social sciences, economics does incorporate mathematics in the theoretical and analytics framework of the discipline. Formal economic modeling began in the 19th century with the use of differential calculus to represent and explain economic behavior, such as utility maximization, an early economic application of mathematical optimization in microeconomics. Economics utilizes mathematics to assess the relationships between economic actors in environments in which resources are finite. The use of mathematics in economics increased the quantitative analysis inherent in the discipline; however, given the discipline’s essentially social science roots, many economists from John Maynard Keynes to Robert Heilbroner and others criticized the broad use of mathematical models for human behavior, arguing that some human choices can not be modeled or evaluated in a mathematical equation. Economic theory and analysis may be applied throughout society, including business, finance, health care, and government. The underlying components of economic theory can also be applied to variety of other subjects, such as crime, education, the family, law, politics, religion, social institutions, war, and science. Economics also allows individual agents to balance expectations. Economics provides distilled frameworks to analyze complex societal interactions, as in the case of consumer and firm behavior. Being knowledgable about economics foundations allows an individual to be an active and aware participant rather than a passive economic agent. Economics incorporates both qualitative and quantitative assessment. Economics can be applied throughout society from business to individual behavior with further application in the study of crime, family and other social institutions and interactions. externality: An impact, positive or negative, on any party not involved in a given economic transaction or act. circular flow: A model of market economy that shows the flow of dollars between households and firms. social science: A branch of science that studies the society and human behavior in it, including anthropology, communication studies, criminology, economics, geography, history, political science, psychology, social studies, and sociology.